Craig’s out of town this week, which means Robert’s been charged with keeping things orderly and sanctioned. Why are we telling you this? Well, because it’s the best excuse we can come up with to explain why things are a little … well … out of the ordinary for this week’s Vinally Friday selections. complicated, Robert has decided it’s time to present his “Best of …”. So be sure to tune in this week’s stand-in morning show re-spins his favorites from the past nine months of Vinally Fridays. Alanya and Tommy will get things back on track (pun intended) starting at 10 am. 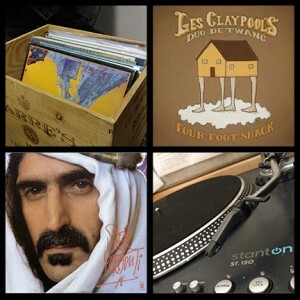 Alanya is reminiscing Tuesday’s The Claypool Lennon Delirium show with Four Foot Shack, the sole release from Les Claypool’s 2014 hillbilly side project, Duo de Twang. Duo de Twang features the bassist and his high school buddy, M.I.R.V. guitarist Bryan Kehoe, on 15 tracks of mostly covers. And not just Primus covers. There’s a little Alice In Chains plus a whole bunch more mixed in – and we’re super pumped to hear this for the first time! After that, Tommy will dish out some Frank Zappa – this time the 1979 double-live album, Sheik Yerbouti. Say it aloud. Scream it at passers by, if it so pleases you. Just don’t blame us. Sheik Yerbouti not only marked a turning point in Zappa’s career (the first to be released on his own label) – but it’s most popular track also sent shivers down the domestic music industry. If you haven’t heard “Bobby Brown,” you’re still not going to. At least not on the Trail. But if you DO know of this highly explicit track and want to learn it’s “secret meaning”, check out this interview Zappa did on Swedish radio.